This is the ninth post of our series of projects to make us thankful for DIY. Be sure to check back everyday during the month of November for new simple and easy DIY projects. We hate tracking mud and dirt throughout our house. It'd be so helpful if we had one of these in our entryway because it'd encourage kids and adults to stop and take off their shoes. Up north they take their shoes off so they don't track in mud, snow, and the like from their boots. In our climate we don't wear boots, but that still doesn't mean we don't have a need. Once my wife was wearing a new pair of sneakers. ("Trainers" for our European friends). This pair had pretty deep tread because they were brand new. She had to walk outside for a short trip and cut through some grass between the neighboring houses. Little did she know that she had walked through where someone had just walked their dog and left dog poo. She came in the house still with her shoes on and managed to walk through the entire house saying, "What is that smell. I smell something, what is that?" Wives have a great habit of being able to detect any smell, much to the annoyance of husbands. Have you ever lived with someone who constantly says, "Do you smell that?" At some point I had had enough and said, "I only smell it when you walk by, did you step in something?" A horrified look appeared on her face as she realized she had tracked it all over the carpet in every room. So it was off to the store to get a carpet steam cleaner. It would have been so much better to have this bench in the entryway where you can leave your shoes off and not have mishaps like that. Leftover 2x4 scraps from a prior build made this project very affordable. If you go the joinery route that Chris takes you'll get some practice in with those mortise and tenon joints but the end result is worth it. 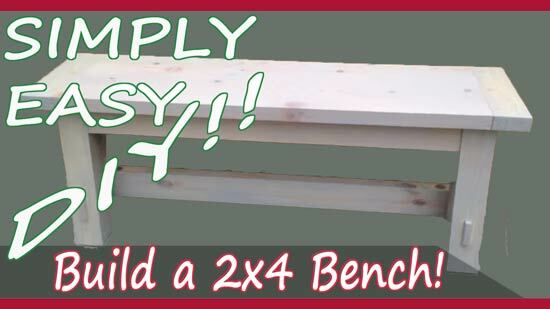 If you are not comfortable with that style of joinery you could always use pocket holes to complete the project, they would work just as well. Chris mentions in the video what the inspiration piece was for this bench. If you go check it out, you'll see that the original retails for around $500.00. Using only scrap materials he already had in his shop, I'd say he did good. I hope you enjoyed today's featured project and don't forget to stop by "CMR Woodworks" YouTube channel to check out even more great woodworking projects from him. Don't forget to subscribe.